People will come from all over bringing their beloved animals, all to put into your care, and it is your responsibility to make sure they look and feel their best when they leave your facility. While making the dogs happy should be your number one priority, it is also of the utmost importance that you make you facility look great too. Remember: no one is going to trust you with their pets if you can’t keep your own building clean and a big part of that is your floor. Let’s face it, the floor is the biggest part of the entire thing and it’s the first thing that people will notice when they walk in. That being said, what can you do to make sure it looks its best? There are many who will use vinyl tiles to keep their floor looking great, and maybe that’s a start, but there are some serious problems with this approach. First of all, they are far too absorbent especially when you consider how many things are going to be spilled on it during the course of a day. Over time the adhesive between the tiles and the floor will loosen which causes the tiles to float, eventually causing a serious hazard. Typically a concrete floor is the answer but it suffers from the same absorption problems as any other type of floor. This is where commercial epoxy flooring will come into play. So why exactly is commercial epoxy flooring a solution that you will want to explore? We mentioned spills earlier and you’re going to have a lot of them. One of the most important things to remember about concrete is that it is absorbent and the moment you spill something it is going to start seeping into the porous surface, which will eventually cause some rather serious problems. Not only will it potentially cause a permanent stain, it will expand beneath the concrete and may even cause cracks – it’s not a situation that you want to find yourself in, especially in an indoor office. Epoxy flooring can make all of these problems a thing of the past. While concrete is horrendously absorbent, epoxy coating will seal it 100%, causing any liquids spilled on it to pool instead of being absorbed. This will make it much easier to clean, and it will of course be stain resistant. It is important to understand that as a dog kennel service you are going to be dealing with far more than just water spills – you’re going to be dealing with a number of different chemicals, some of which have more detrimental effects on floors than others whether it’s shampoo, conditioner, or something equally nasty. Also remember that many of the dogs that enter your facility will be in less than pristine condition, meaning you’ll definitely have other things to clean up after when you’re running your facility. 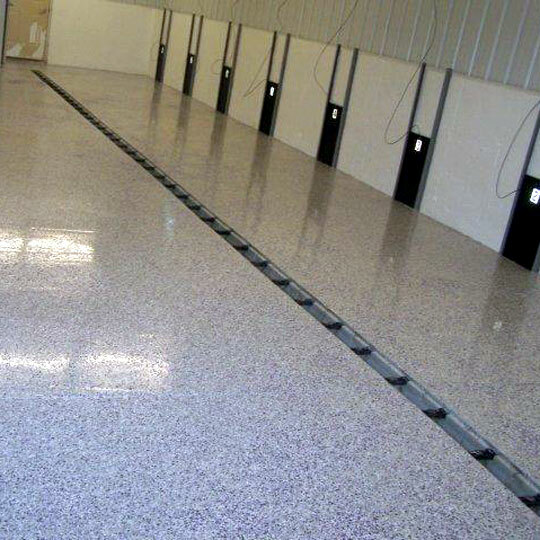 Finally, epoxy flooring can be augmented with an anti-slip additive which is very useful in a grooming situation. There is little doubt that your floor will be constantly wet and the last thing you want is for your workers or your furry clients to slip! It’s definitely going to help you, and the best part, is that the commercial epoxy flooring is incredibly easy to install whether it is during the initial build of your facility or a later addition. Check into our commercial flooring epoxy products today and get your floor ready for the inevitably messy future. How can I get one?